When I set out to explore a new approach to work back in early 2004, I had one primary criterion: simplicity. I sought simplicity in material, simplicity in process, and simplicity in imagery. There was little question in my mind which single medium would see me through this task--the collagraph. It's always been collagraphs for me, ever since I was introduced to it back in school. A collagraph was, in fact, the very first print I ever pulled off the press. I was immediately taken by its direct, tactile nature and the transformation of humble, everyday material into lush printed marks. 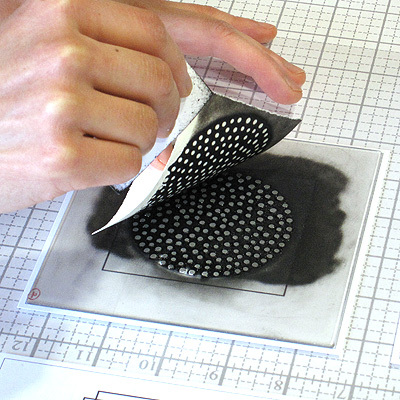 Collagraph derives its name from the Greek words kolla (glue) and graphos (to write). It is a relatively new medium, having gained popularity with the development of synthetic material and movement toward abstraction during the twentieth century. As its name suggests, artists may employ any number of materials, textures, and media in the manner of a collage to construct their plates. For me personally, physicality of the collagraph, as well as its inherently experimental nature, are what draws me to it as a medium. Construction of collagraph plate begins with clear acrylic sheets, which I prefer over chipboard, hardboard, or metal base plates, for their absence of pre-existing surface texture. They also take beautifully to beveled plate edges, which I have always loved on intaglio prints. Artwork in reverse is placed under the plate and I am set to begin putting down my marks. I carefully administer the modeling paste marks onto my plate--a single dot at a time, using squeezy bottles. Basic structure of the imagery is predetermined, while exact placement of individual dots is decided as I am working on the plate. Once modeling paste has thoroughly cured, I proceed to "work the plates," a process whereby each dot mark is shaped to a height and contour optimal for the printing process. This step is most akin to sanding and polishing, except that there is no sandpaper involved. I use small pieces of plain 8 1/2 x 11 paper, as even the finest sandpaper would obliterate fragile dot marks and introduce unwanted plate tones. 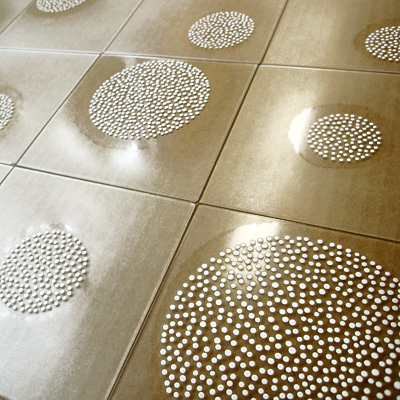 The goal here is to give each dot a clean, planar top profile at the appropriate height. I rely heavily on my sense of touch during this critical stage, since the dimensional differences of tiny dots are almost impossible to discern by sight alone. 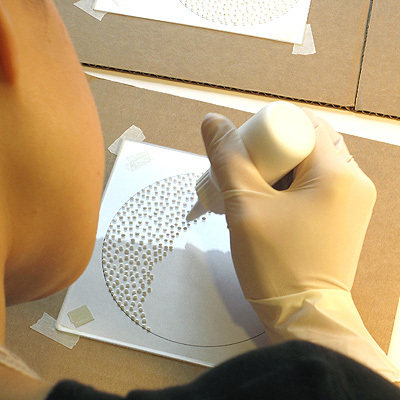 The step is labor intensive, yet a crucial factor for producing crisp printed marks. And finally, a small amount of acrylic coating is applied on the plate to protect its surface and introduce an aquatint-like tone. Collagraph plate is then printed in intaglio technique with a few notable exceptions. Every printmaker will agree that ink characteristics vary a great deal depending on one's particular process. In my case, variables include relative "age" of the matrix or integrity of marks remaining on the plate, physical dimensions of the matrix, and whether chine collé will be a component of my imagery, to name just a few. 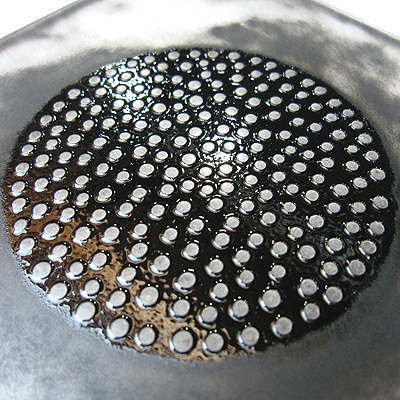 In general, ink consistency is considerably looser and of a lower viscosity than in other intaglio methods. 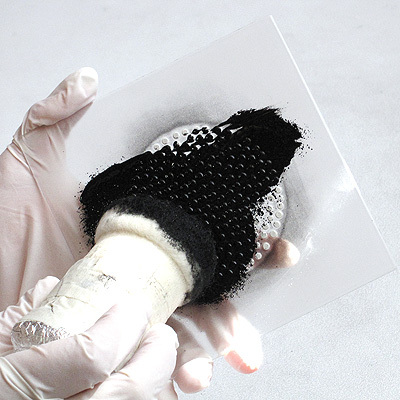 Ink application is accomplished with a soft dabber rolled out of synthetic felt, as I find commercially available dabbers much too abrasive for the delicate plate surface. For plate wiping, I use the smoothest newsprint I can find on the market (no tarlatan ever goes near my plates!) and cut it to fit the proportions of my hand. This format is deliberate and conducive to proper wiping of my plates. There is one additional criterion I established for myself that I have yet to mention: safety conscious printmaking. Early in my career, I took little heed to many of the safety precautions; like most twenty-somethings, I thought myself invincible. True, I had already committed myself to the collagraph, a medium intrinsically of low toxicity. Still, I was using solvents with abandon and wore protective gloves only intermittently. By my late twenties, the exposure had taken its toll and I found myself riddled with a list of sensitivities and allergic reactions. It was at this point, spurred on by other life changes, that I made the decision to take a few years hiatus from printmaking. I vowed to myself then, that when I returned to the printing press, I would find a way to do it differently. The use of decidedly simple, low-tech materials and tools in my current methods translate effortlessly into a nontoxic practice. As noted above, materials involved in the construction of my collagraph plates are few. Further, marks are manipulated manually, rather than with the aid of a mordant. For the printing phase, while I use oil-based inks, clean-up is confined strictly to the use of vegetable oil, and occasionally, soap and water to address any residual build-up on the plate surface. Finally, I use a bit of rubbing alcohol to degrease the work area. And, indeed, I now don latex gloves routinely and they have, in fact, become an indispensable "tool" in the wiping process, as they provide the grip and traction necessary to control and maintain contact between the smooth newsprint and plate surface. One final note. Collagraph plates tend to have a limited life span in comparison to their more heartier intaglio cousins. In my particular process, for instance, dot marks flatten out progressively with subsequent inking and pass through the press. Although I would like to see longevity for my plates, I do very much take pleasure in following each plate through its lifecycle, with the earliest impressions pulled bold and saturated, and latter impressions nuanced and subdued.There is tremendous gratification in witnessing the evolution of a process firsthand--understanding its limitations and unique possibilities. I believe the collagraph to be a medium whose potential is yet to be fully realized and whose visual vocabulary is ripe to be expanded many fold. It is, too, a medium that is by nature, adaptable, and as such, a prime vehicle for research and study into a singular approach to work. As for myself and the collagraph, we continue to make strides toward simplicity: identifying, distilling, and preserving what is essential, and leaving behind what is not. Putting down modeling paste marks to construct collagraph plates. 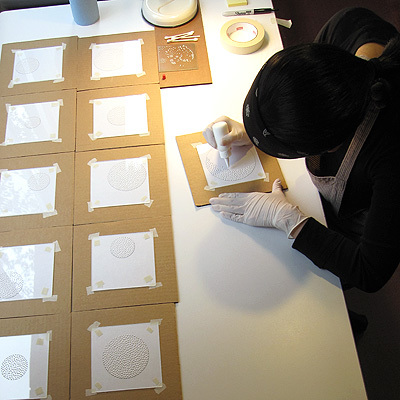 Completed collagraph plates that have been "worked," a process whereby each dot mark is shaped to a height and contour optimal for the printing process. 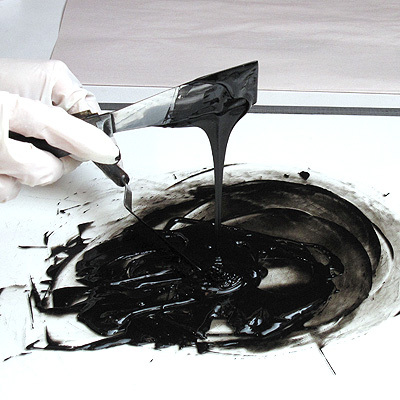 Preparing ink for intaglio printing. Inking the plate with a soft dabber. 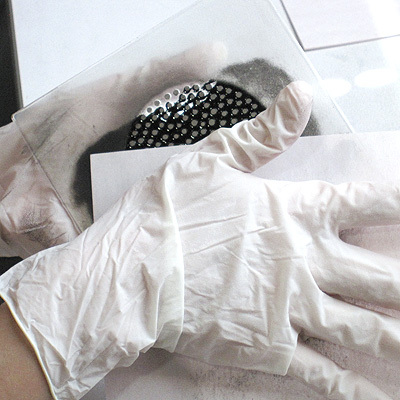 Wiping the plate with newsprint. Collagraph plate inked, wiped and ready to print. Pulling an impression of collagraph. © 2019 Eunice Kim. All Rights Reserved.